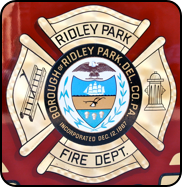 Organized December 12th of 1887, Ridley Park’s 25 active volunteers provide Fire & Rescue protection to Ridley Park, Prospect Park, Eddystone and Tinicum answering an average of 400-500 alarms annually. Classified as a light rescue, this well maintained rig is equipped with a light tower, Hurst extrication tools, water and high angle rope rescue gear. 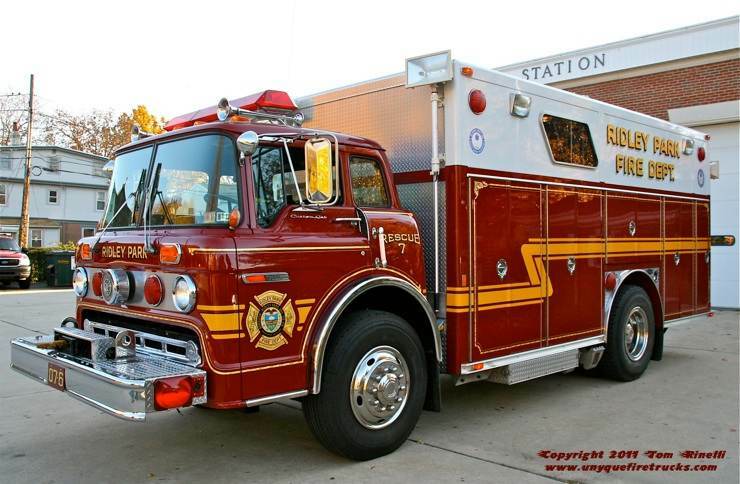 This rig proudly held the title of “Best Appearing Rescue” at the PA State Firemen’s Convention Parade for many years during the late 1980’s through the mid-1990’s. Engine 07-1 - 1995 Emergency One 2000 gpm/750 gal. 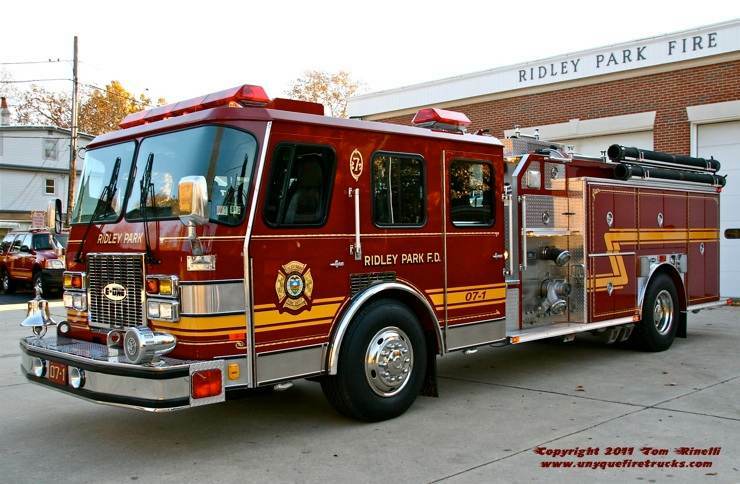 This rig is only the third aerial apparatus operated since 1954 during which time Ridley Park has maintained a strong loyalty to American LaFrance. In 1954, the department received an open cab 700 series 75’ mid-mount that operated for 26 years until replaced by a 1980 Century 1000 series 100’ mid-mount aerial that served until 2003. 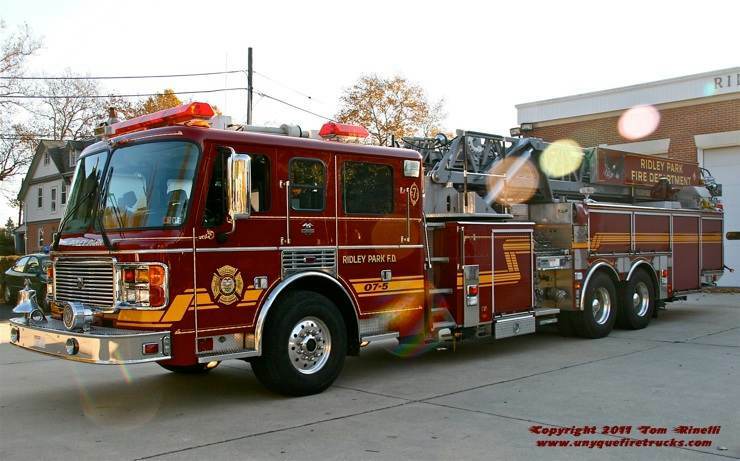 When the current aerial (the first quint ever operated by RPFD) arrived, the department retired its’ second due engine and merged it with the quint. Equipped with a light tower and high angle rescue equipment to support Rescue 07-6, this rig is first due to structure fires outside of town and provides mutual aid to three towns as a truck company. Special thanks to Engineer Mark Dougherty & FF Pete Chartier for their hospitality and assistance positioning the apparatus and providing background information on the department. 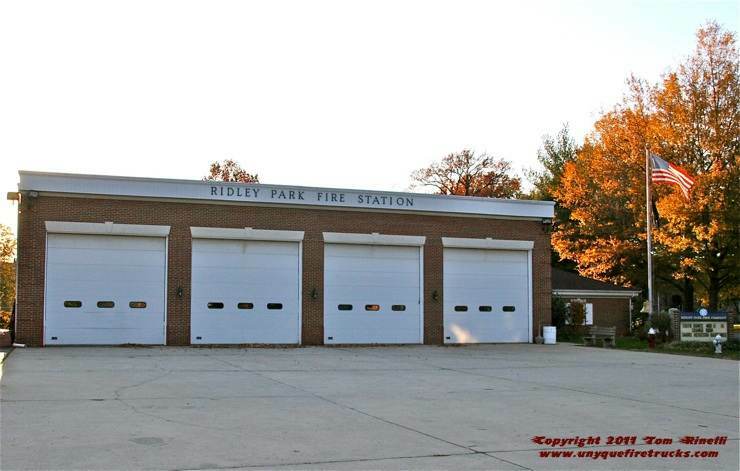 Ridley Park operates from their entire fleet from this four bay firehouse. 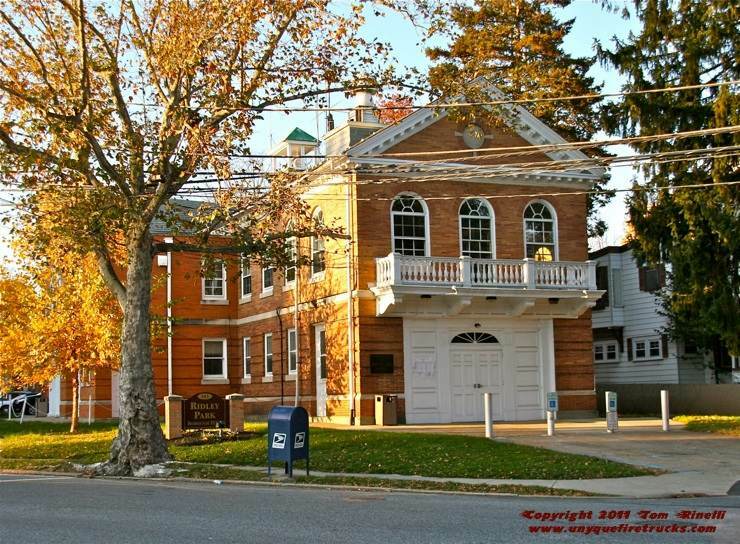 This firehouse is now used as a community senior citizen center. Despite its’ age, it is not the original firehouse - Ridley Park’s original firehouse burned down in the early 1900’s.